This is a short and simple guide about how to use the Simple UCC Compiling program made by Rene Kok. The latest version fixes some small bugs and changes the layout slightly. The removal of the 3 buttons at the bottom being the most noticable. The Simple UCC Compiling program is a handy little program that makes compiling a lot more enjoyable. With this, there is no more need to open a dos window or type “ucc make” etc… You just click handy buttons. The program also has some nice features including auto deleting your package, so never again will you have to manually delete your file before compiling, which if you are anything like me you no doubt forgot a few times. First you will need to download the Simple UCC Compiling progam. Lets take a look at the program. When you open it up you should see the following window. At the top there are three menus, the “File“, “Actions” and “About” menus. The “File” menu has two options, “Reset Defaults” which sets all of the settings to their default settings, and “Quit” which exits the program. The “Actions” menu has three options. The “View EditPackages” options displays the list of EditPackages of the UT2004 installation that is specified in the “UT Directory” section. 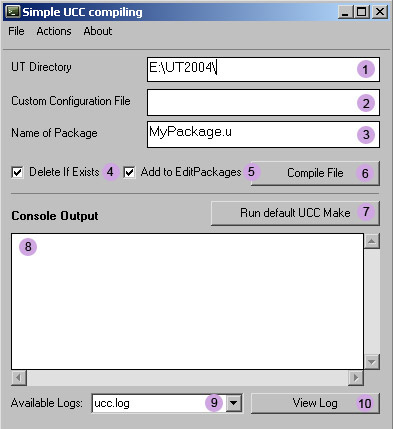 The “View UCC.log” option displays the UCC.log file which is located in your UT2004/System folder. This option requires that the “UT Directory” section is set up properly. The “Display Last Error” option should display the last error encountered. The “About” menu has one option. “About Me” option displays some information about the author. In the image you can see I have placed numbers next to the other options. Please refer to this table for more information. 1 Input the directory of your UT installation. 2 If you wish to use a custom .ini file for compiling input it here, otherwise leave this blank. 4 If you plan to use the “Compile File” feature described in number 6, then check this “Delete if Exists” box to atuomatically delete the .u file before compiling. 5 If you plan to use the “Compile File” feature described in number 6, check this “Add to EditPackages” box to automatically add the package to the EditPackages list. 6 The “Compile File” button, this compiles the packages. This button uses the “Delete If Exists” and “Add to EditPackages” options and the “Custom Configuration File” if present. 7 The “Run default UCC Make” starts the compiling process just as if you had typed “ucc make” manually in a dos window. 8 This is the output window. This displays the compiling information. Errors and warnings are also displayed here. 9 You can cycle through the different log files here. 10 This “View Log” button displays the currently selected log. TIP – Back up your work incase anything goes wrong. Don’t forget to back up ini files too. Did you write this little beauty, Ini? Nope, it was made by Rene ‘LT’ Kok. It’s very handy! What happened to editing the monster source code? I cant find that anywhere now.